You know what they say about hindsight, then again it wouldn’t take 20-20 vision to see an elephant in my living room. Nope, that would be impossible to miss. Yet when I first had the suspicion that I was going through the change I missed something that big for quite a while. One of the most difficult things I ran up against in the early months of perimenopause was describing what I was going through. I’d mutter to myself that I was just feeling so weird, that my moods were strange and I felt overwhelmed. I didn’t recognize myself in the mirror some days. Driven by this I asked a lot of questions and started reading about early menopause indicators. I began collecting a list of menopause symptoms gathered from books, websites and other women’s stories. But something kept nagging at me, something was off. I ran across so many references stating that menopause is a natural event in a woman’s life. Reading further into these articles the discussion of symptoms would be the most prevalent idea presented and the reader urged to get a diagnosis or seek treatments. For example, one four page article describing menopause and perimenopause used the phrase “it's a natural cycle of life” once and the word “symptom” fifteen times including the subheading “Menopause Symptoms”. From one of the largest menopause education programs in North America, the single page article describing perimenopause uses the phrase “prior to natural menopause” once and the word “symptom” 11 times. This depiction bothered me, but I kept right on repeating things I has picked up never stopping to take a look at what that nagging feeling was all about. I don’t bring up these examples to criticize, but to underscore how I’d accepted the conventional viewpoints surrounding menopause unconcerned with the bias built in to the vocabulary. While menopause has broken away from being a taboo subject, this use of biased and contradictory language is common throughout the literature and in everyday conversations between friends and professionals alike. So what is the big deal? Is there any real problem here? I certainly felt uneasy with the assumed pathology inherent in the verbiage. However I questioned myself about its importance. Am I being overly sensitive, creating an issue where one doesn’t really exist? Am I just getting vexed like the typical, ahem, menopausal woman? While I remained undecided, this small point of discontent became the elephant in the room. There most certainly was something there. It took me a while to clarify this one for myself, but once I did a significant shift occurred. It was tricky because the bias is hidden in the meaning of the words. This acknowledgment of bias was important because I believe that language defines and shapes our reality. My word choice can expand or limit my experience of life. When I unquestioningly use or agree with popular phrases, like the words “symptom” and “menopause” paired as if they characteristically go together, this brings with it the connotations and cultural value judgments associated with them into my experience. It also reinforces them. The truth is that menopause is natural, normal and ordinary. The language I was using did not reflect that fact. At first it was awkward to go against the established norm and break up that false pairing of “menopause symptoms”. But that is precisely what I did. I quit using the word symptom in association with menopause. In its place I selected the word sign. The word symptom is appropriate when used in the context of describing illness or problems. However when used in conjunction with menopause it conceptually turns menopause from a natural ordinary event into a pathology or sickness where the implication by association is that there is something wrong, something to fix. Thus the value placed on the menopause experience from the get-go is negative. Using this kind of language even before menopause is actually happening, we all start out with a deficit that must be overcome just to get to neutral. In that reality, potential menopause indicators however slight set off alarms, giving reason for worry and a defensive stance to look out for increasing signs of a problem. The word sign does not evoke apprehension. The word sign is value neutral. Because of this I now use it in my writing and in all my conversations about menopause, including when I talk with medical professionals. I want to emphasize that I did not just exchange one word for another, but I rejected the entire frame of reference that the use of the word symptom carries with it and adopted a different point of view, that of a sensual researcher. To do this actively I began to notice and describe what sensations were happening as my body changed. I noticed the indicators and evidence, all of which are concrete. In present time I noticed the intensity and duration of signs in my body and the accompanying thoughts and feelings. Pinning down specific sensations, in particular physical locations in my body to a specific moment in time eliminated my confused portrayals of “weird”, “strange” and “overwhelming” things happening to me. Events became describable in ordinary and understandable terms that I could clearly communicate to others. I left the emotionally charged words out and used my senses as the basis for my observations. I realized over and over again that what I noticed simply confirmed that yes indeed I’m making the transition into menopause. Yup, it is happening right now, I am aging normally. No alarm required. So far it is been perfectly within the scope of ordinary! It has been over three and a half years that I’ve been in perimenopause and at least two years since I confronted that elephant in the room. Coupled with my sensual goals, this ordinariness has expanded my capacity for having pleasure and fun with the signs of menopause. I’ve passed along what I’ve noticed about using the word sign instead of symptom. Out of that I have had some unexpected and revealing conversations with both men and women. I’ve discussed confidence in knowing my body, related experiences of menopause through paying attention to my senses and ideas about how to get the most enjoyment in this transition and they have talked about similar positive experiences and ideas. I’m curious what you think about making this one change. Do you think it matters? If the switch in language spread into the sources for menopause information do you think it would have an impact for others as it did for me? You raise an very interesting question. Language is power and changing that power can change other things too. Thank you for your post, Yvonne. I agree with you, our words do shape our reality. "My word choice can expand or limit my experience of life." Important point. I too prefer to use words like " signs" or "transition" when acknowledging or describing what I'm experiencing in menopause. I also like this..."through paying attention to my senses and ideas about how to get the most enjoyment in this transition"...excellent reminder to go for the fun! 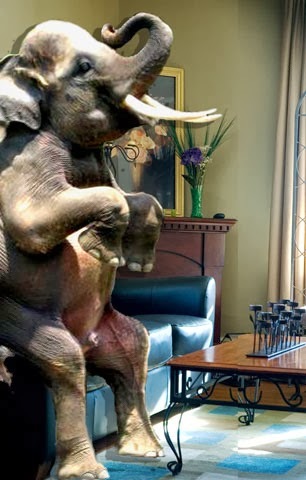 I LOVE your photo of the elephant in the living room! And yes, I completely agree that the word symptom make the experience sound like a disease or illness. Sign is a much better word and way of referencing. Thanks for this clarity!